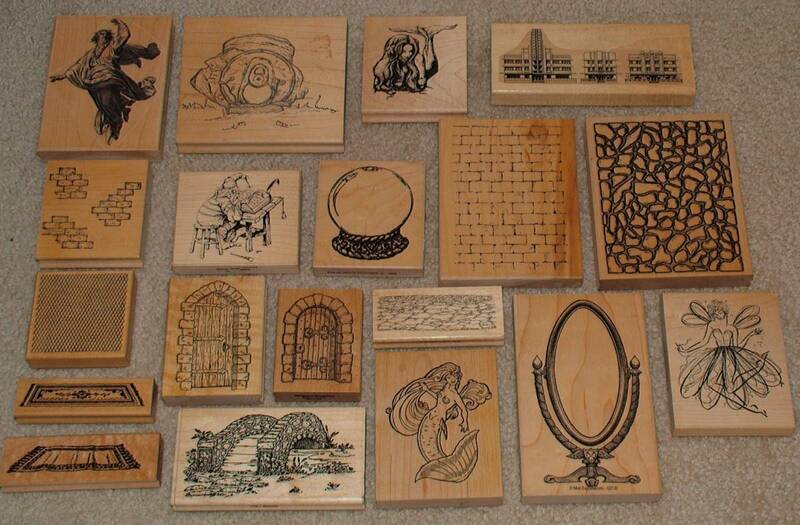 I do enjoy rubber stamping but above and beyond that I'd have to say I'm primarily a rubber stamp collector. I find these miniature works of rubber art to be an addictive hobby that I can't seem to get out of my system; so they are slowly but steadily taking over my workspace. 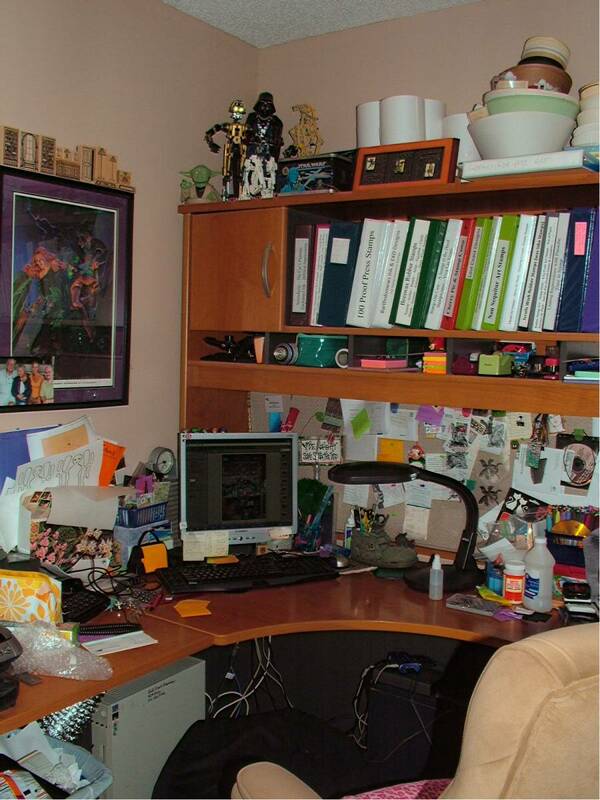 This was my work area in our shared office till I over loaded it with "stuff"
and took over my hubby's side where the desktop computer is. 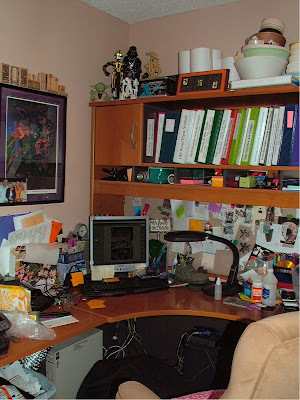 So much so, that I've taken over what was once a shared office and resigned my hubby to the living room with his laptop computer. My door should have a sign on it "Beware - Crazed Crafter on the Loose". 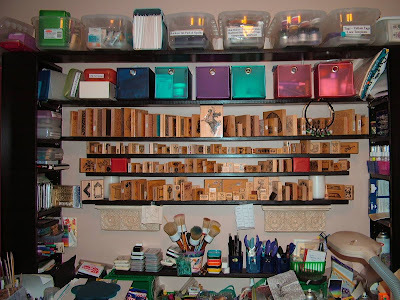 I have rubber stamps on wall shelves, in drawers, in boxes under the desk, and the unmounted ones are in binders on a shelf over the other desk. create my art in that one cleaned off patch of desk in front of the keyboard. FYI - those stamps over the picture were designed by me. 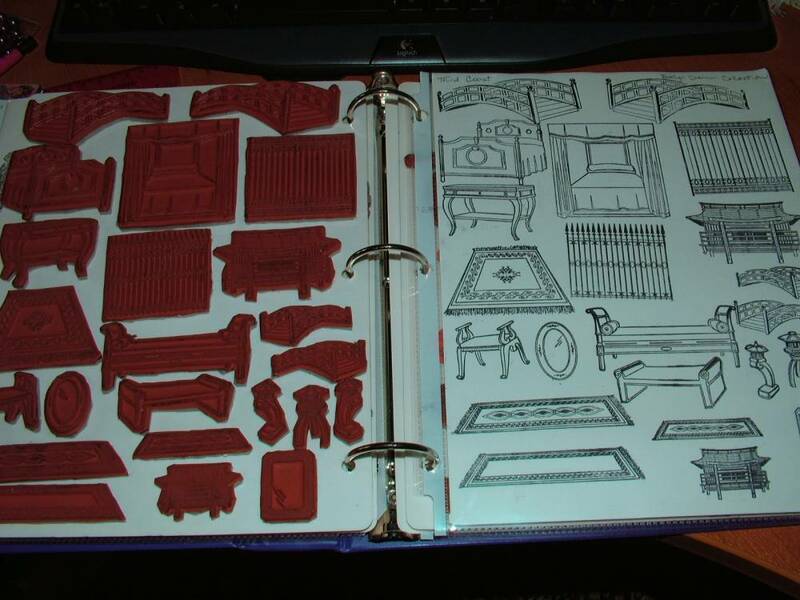 These are my binders of unmounted rubber stamps. They take up a lot less room than the wood mounted ones do, this way. 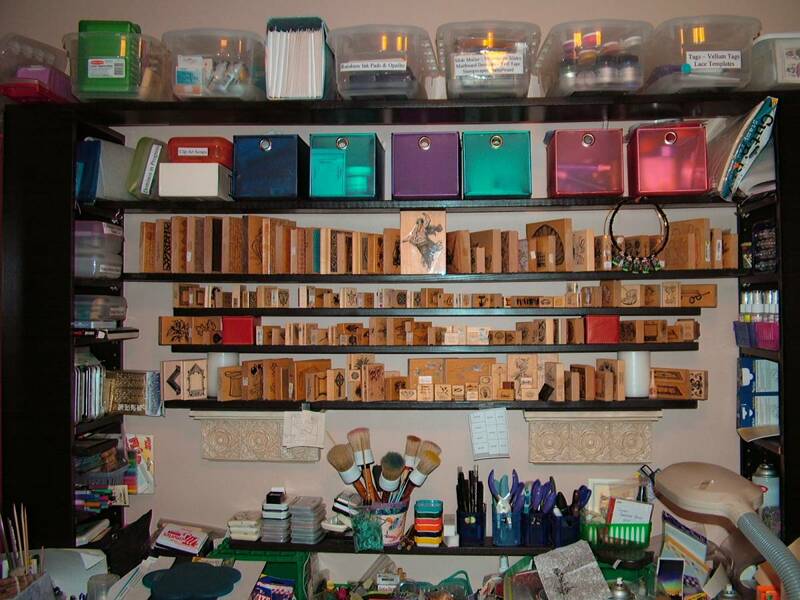 I have them all organized by manufacturer so I can remember who made what stamp. 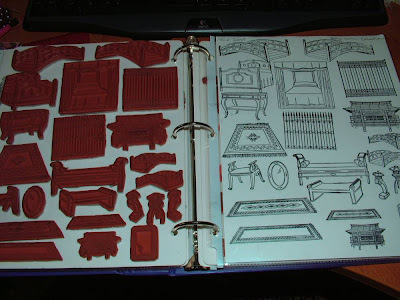 An example of one of my unmounted rubber stamp binders. This is a page from my Third Coast Rubber Stamp Binder. I use EZ-Mount foam and EZ-Mounting Boards to store all my unmounted rubber. I have 10 acrylic blocks in different sized that I use with this stamping system. All my Third Coast images have the initials "ED" prior to the item number. I'm always on a quest for that "missing" stamp to my ever growing collection and it just depends on my mood as to what that stamp might be. 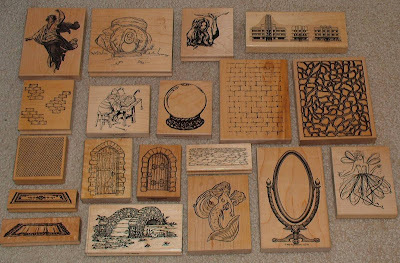 I got into the stamping game about 6 years ago, at a time when many amazing stamp companies were closing up shop and their wonderful images had stopped being produced. Most of my hunting takes place on eBay; where on occasion I find that hidden treasure at a reasonable price. Some of my favorite eBay finds. There have been times the stamp I've been looking for comes up but is priced higher than I would like to pay, so I let it pass in hopes that I'll find it at an affordable price on anther day. This VIP "Visual Image Printery" stamp went for $46 last year on eBay. want to pay over $30 for a stamp, so I let this one go on it's merry way. Update - October 20, 2010 - I now have this stamp in my collection!!!! Click HERE to see it and a box full of otherVIP stamps I was able to purchase. Then there are those great finds I purchase but I'm left to wonder who the maker of the stamp was. Occasionally this happens on a wood mounted stamp that have no markings on it; but most of the time it happens when I purchase unmounted rubber. 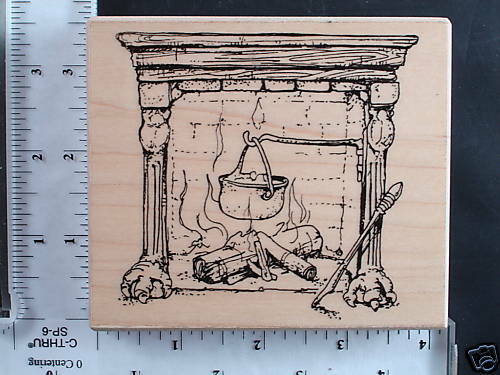 This too is a bit daunting for me since I now have a great stamp but I don't know who made it. (I like knowing what companies made the stamps I use). 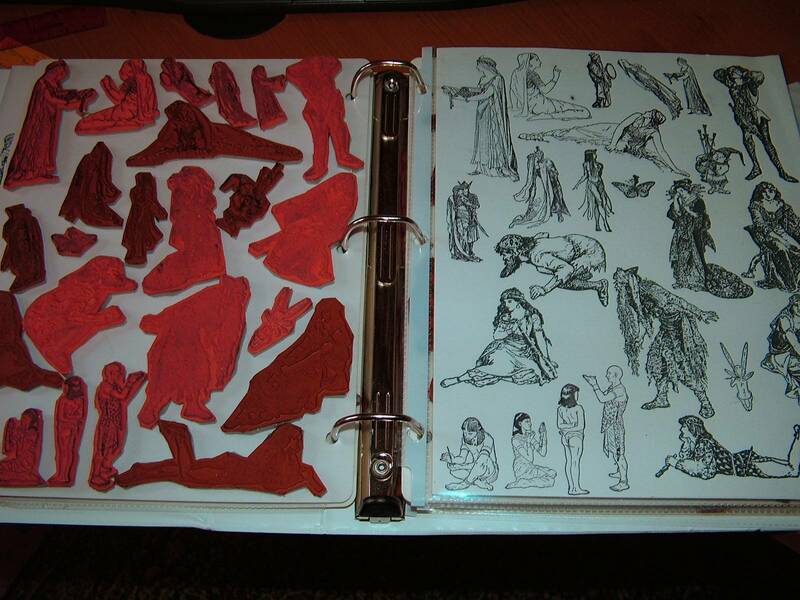 Here are 2 fun stamps I bought about 6 months ago but I am not positive who made them. 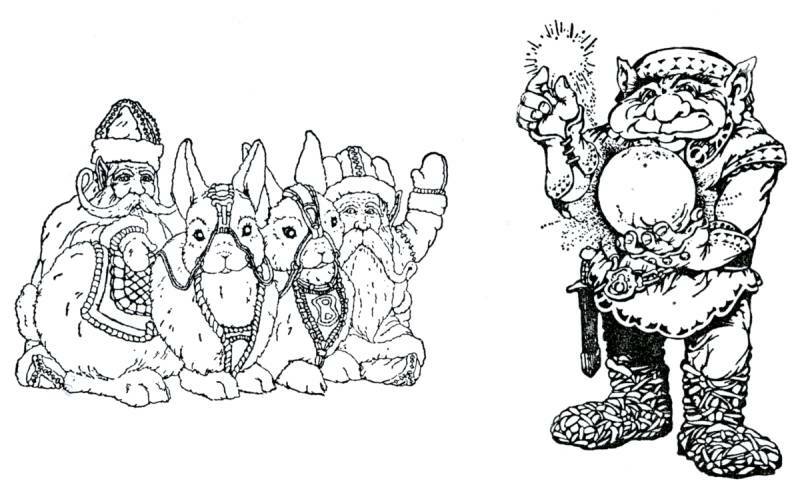 I think the large troll might be VIP or Co-motion but I'm not 100% sure. 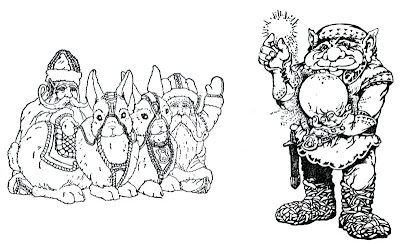 I'm still clueless about the Santa/Troll/Vikings with harnessed Bunnies but I thought they were to great to pass up and had to add them to my collection. Update - 10-22-2010 - The Large Troll is VIP (Visual Image Printery). There are still many great stamp companies out there and they have some amazing images to offer. Right now I'm on a Steampunk kick, so I've been web hunting my favorite tried and true stamp companies to compile a new shopping list of goodies I must have. Here are my most recent finds that I've added to my potential "BUY" list. 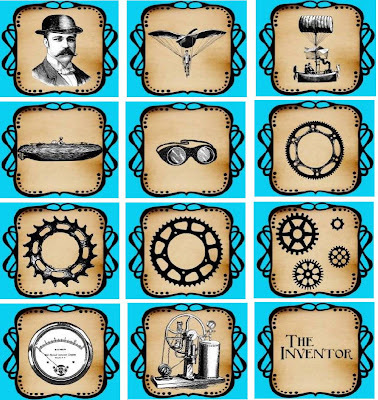 Steampunk style Stamps by Oxford Impressions Stamps. 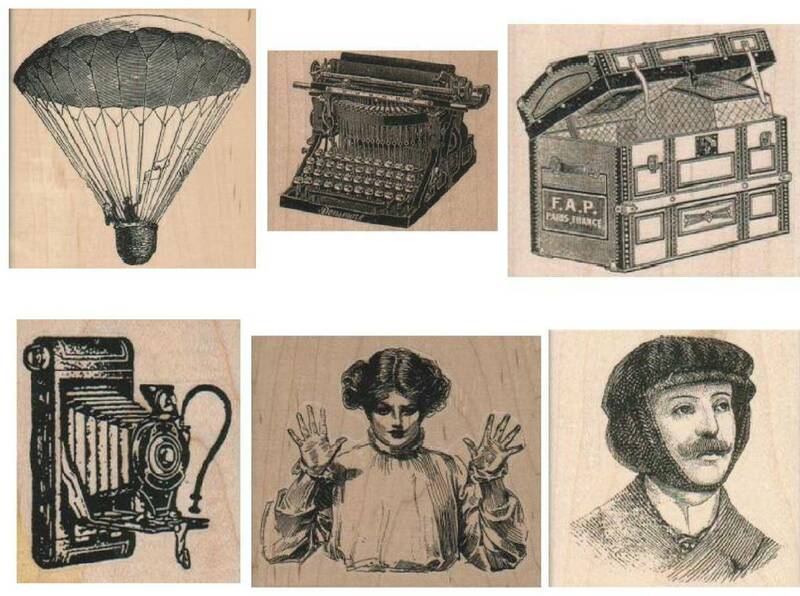 Steampunk Stamps by Scrolls Work Rubber Stamps. Steampunk Style stamps by Viva Las Vegas Rubber Stamps. I'm still hunting, so the list keeps growing day by day. I'm obsessed with Steampunk too, Evelyn and have a lot of great new Steampunk artwork to go on boards... when I find some time... I just can't get enough of that... thanks for liking our stamps. Hey Stampo - You guys have a ton of great images in so many different styles and I'm glad to see the Steampunk line keeps growing.